Summer and Spring brings us great riding weather. The temperatures are warm, the sun is high, and the general feel of the outdoors is inviting. But with this nice, warm weather comes the chance for Sudden Showers and Storms. 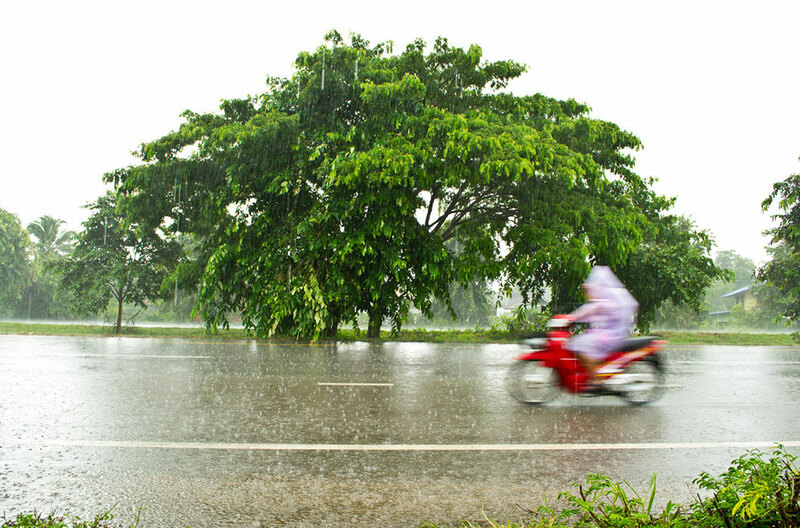 These rainstorms can take you by surprise, and if you're on the open road on your Motorcycle you'll need to know a few things to get home safely. This isn't something you can do right when you see the sky go gray, it's something you need to do now. Make sure your tires can handle a rain. Some people have tires that are worn and slick, these are dangerous on roads in normal conditions. Add rain to the mix and you're just asking to go down, and go down hard. Tires are the only part of the Motorcycle that touches the road, this point of contact should be checked often. Obviously things like trash, rocks, and other foreign materials in the road are going to be dangerous, but these are always dangerous. With the rain a few extra things become extra scary. Manhole covers, reflectors, and white painted lines are all super dangerous with the rain. Riding over a white line can make you spill very easily. Take the extra time and be cautious. This goes for railroad crossings, too. Take those very slowly. So, you're stuck in the rain. Okay, that's not so bad. But when was the last time it rained? If it was over three days ago, you're going to be facing a worse rain than normal. The reason for this is because the roads over those three days (or more) have been accumulating sand, dirt, and oils from all the other cars and motorcycles on the road. With the new rain, those things come loose and can make for some scary spots on the road. Whenever you have to break on your bike in a slippery situation, it is best to use the rear break more than the front break. In these situations, if your back wheel loses it's grip, you have a chance to correct it and regain your balance. If your front wheel goes, though, you are going down. Balance this by good speed control and giving yourself plenty of time to break. Take the lessons you know from driving in a car and use them for motorcycle riding. Things like slowing down, leaving more space, avoiding puddles, and being visible are all very important. Remember everything is exaggerated on a motorcycle, the dangers especially. If you feel uncomfortable, that you may not be able to make it home, find a place to stop and wait it out. Any time you catch yourself being caught in the rain, you have some decisions to make. Following these five tips can be what you need to make it home as safely as possible. No matter your level of skill, these tips will make you safer. Good luck and enjoy the roads.